Hello! Today I'm back with a quick swatch of an OPI polish and a bit of simple stamping. 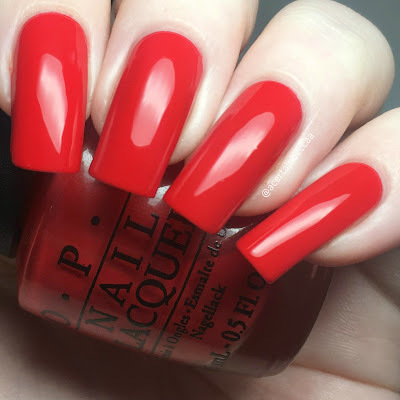 I recently purchased OPI's 'Coca Cola Red' in a destash (the same one where I grabbed these China Glaze goodies). I feel like this is a classic OPI so I couldn't pass it up. Read on for my swatch and to see what I stamped! 'Coca Cola Red' is a classic red creme. The formula is super smooth and easy to apply. As is typical for reds, this is a bit sheer, but it does cover very evenly. I could still just about see my nail line after two coats, so added a third to make sure. Below is three coats with topcoat. For my stamping, I used UberChic Beauty plate Geek Love-01 (also recently picked up in a destash). Every time I've seen this plate the bundle of mix and match faces always catch my eye. 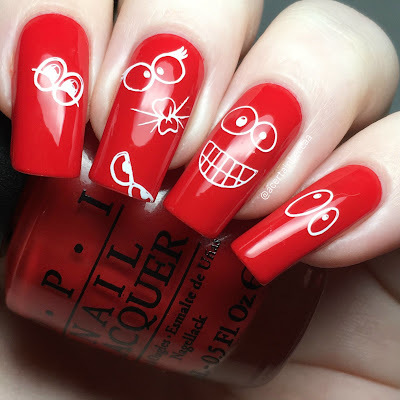 I played around with a couple of them, stamping with Hit The Bottle 'Snowed In'. What do you think? I'm loving my goofy faces, they sum me up pretty well! I'm also happy to add 'Coca Cola Red' into my OPI collection. Speaking of OPI, I have one of the new Grease shades to show you in my next post, so remember to come back on Wednesday to see.